Facebook Privacy Settings aren’t exactly hidden, but they are just subtle enough that they can be difficult to find, and then worded just so that you aren’t sure what you’ve changed. We hope to walk you through it just a bit so that you have a better idea of what you are sharing and with whom. 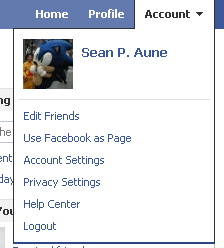 Getting started is easy, simply go to “Account” in the top right and look for “Privacy Settings” as you see to the right. Click on it and launch into the wonderful world of controlling who sees what. From this one page you’ll be able to access all of the different security areas that you need access to, which, as you can see, are split into many different areas depending on what you use your account to do. The main focus here is controlling on what actually happens with the data on your profile. Everyone – This will allow everyone to see absolutely everything about you, and is probably the least desirable setting to go with. Friends of Friends – This setting makes the first four selections open to Friend of Friends and the remaining open to just Friends Only. Friends Only – Marks everything as Friends Only and is pretty much the opposite of Everyone. Recommended – This one mixes all three by putting three into each column. To choose any of these as your setting, simply click on the name and then click on the Apply These Settings button that will appear in the bottom right. The final option you have is to customize your own settings which is personally the way I like to go. Some stuff I don’t care to show at all, but I couldn’t care less about my birthday, and under other settings it tends to get hidden. Sorry, but I don’t view it as a state secret. To me customizing is the way to go, and then you have at least some control over what is going on. 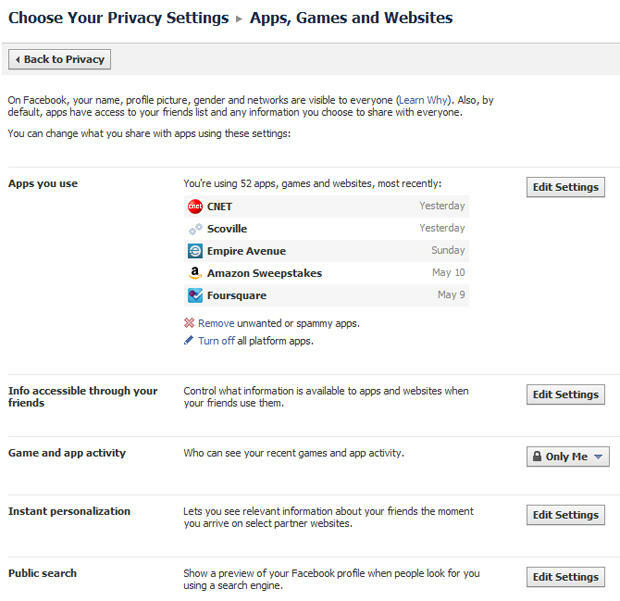 Beyond your basic information you also use this page to control apps and how you interact with Facebook around the Web. By clicking on Apps and Websites at the bottom left of the page, you are taken to the following controls. From here you can edit and remove apps, see what information is available from your friends, control the instant personalization that can happen on some sites and more. It’s worth it to go through each one and make sure that you read them carefully. Essentially, as Facebook becomes a bigger and bigger presence on the Web, it wouldn’t be a bad idea to every so often go through your settings and make sure that you haven’t missed an announcement of something new, or some new feature got added that you are unaware of. If we’re going to let one site control how we interact with other sites, then it is our responsibility that keep current with all of the latest changes in its security. Of course, you could also always follow our own Emily Price’s rules of how she chooses friends on Facebook and then just shut your account from the rest of the world. Numerous issues would be solved. 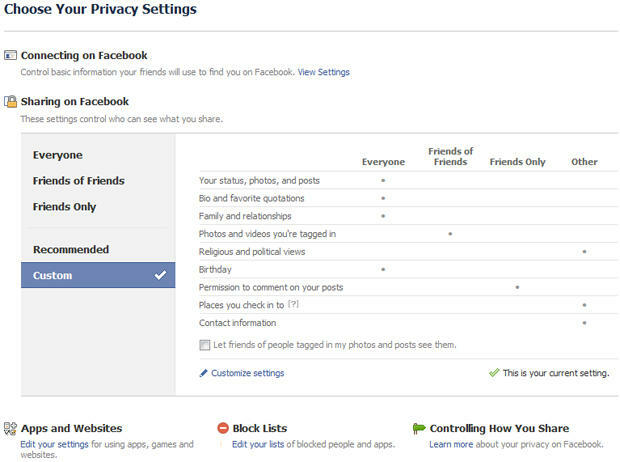 Do you check in on your Facebook security settings?